Why Choose a CCN Contractor? Home improvement and construction is the industry with the second highest amount of complaints each year, and it has been holding this position for over six years. Most of these complaints are related to shoddy work and failure to start or complete a project. For this reason, Certified Contractors Network is committed to providing contracting companies with the resources and training necessary to learn how to provide their customers with a superior home improvement project experience. In addition to teaching our member companies how to provide consumers with the quality work they deserve, we train our members on how to educate consumers about making a successful construction investment. It is our belief that if properly educated, most consumers will make better decisions about whom to contract with and enjoy greater satisfaction. Qualified Remodeler and GuildQuality conducted surveys on behalf of Certified Contractors Network of homeowners that hired CCN contractors. They questioned CCN members’ customers about the jobsite cleanliness, timeliness of project completion, expectations met, and contractor to customer communication. 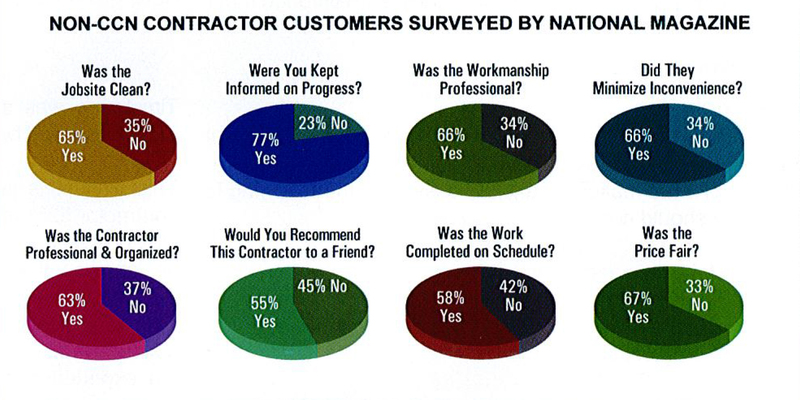 In every one of the five categories, CCN members received higher satisfaction ratings than non-CCN contractors. The exact percentages of satisfaction levels can be seen in the charts to the right. 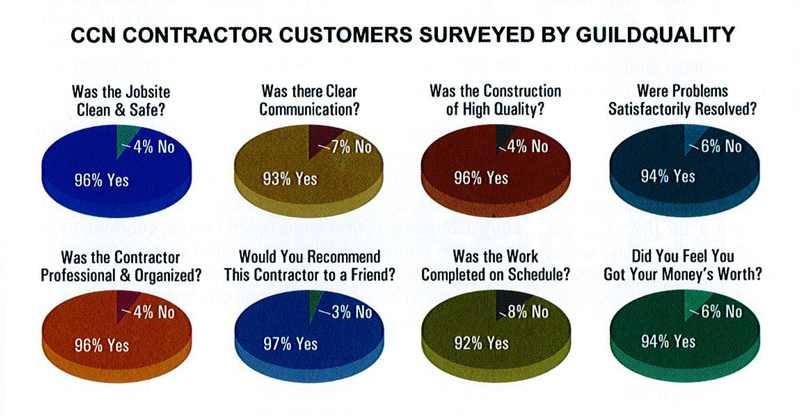 Compare the satisfaction levels of consumers who used a CCN member contractor and a non-CCN member contractor. When making an expensive decision like choosing a contractor for your home improvement project, is choosing a non-CCN member contractor a risk you can afford to take?